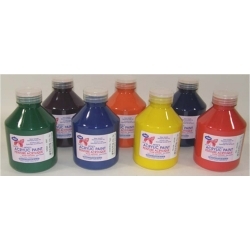 Polymer paint formulated to be suited to all levels of student activity. Use also for most craft applications. Water soluble while wet, it cleans up with soap andwater but is permanent once dry. Blend colours using a pelette.Clear PET plastic bottles with seals and dispenser caps.